Hey Guys! 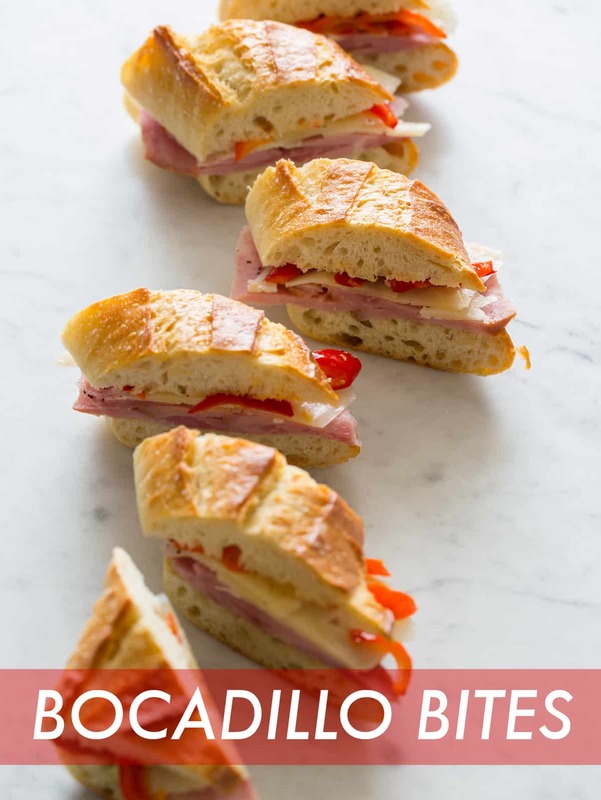 Today we have another great picnic sandwich for you, Bocadillo Bites! 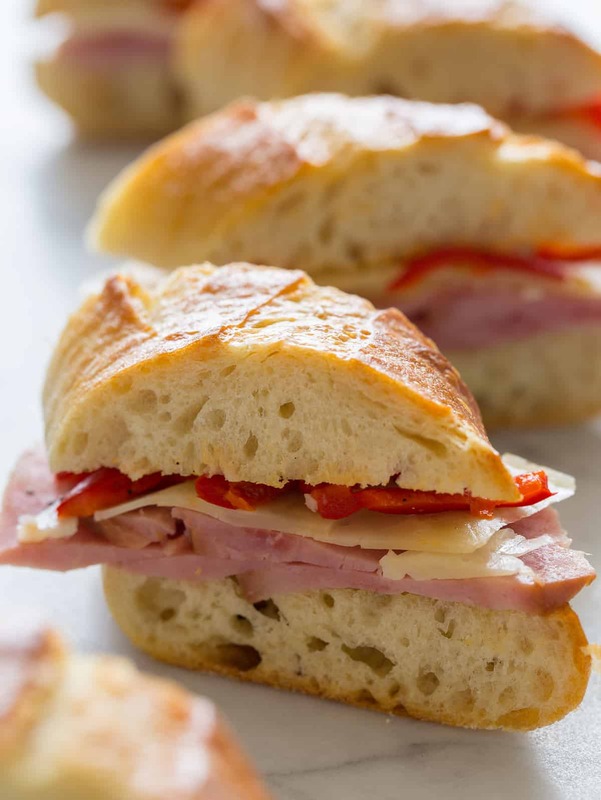 Bocadillo are Spanish style sandwiches served on a crusty baguette. They’re usually pretty basic sandwiches that can be filled with anything from omelets to cold cuts to sweets. I had this particular type of Bocadillo in Spain years ago although I think the peppers were different. I remember looking at the sandwich with lack luster thoughts, wishing I had some mustard and mayonnaise to slather between layers of what seemed to be a dry and sad looking sandwich. I was so wrong and pleasantly surprised! The uber simple sandwich was delicious, full of flavor and perfectly filling. For something so simple it was perfectly balanced. I was pleasantly surprised to see it on the menu of one of my favorite, local (Southbay) restaurants, Abigaile. If you like Manhattan Beach Post I highly recommend Abigaile. The food is wonderful; from their hamachi sashimi to their roasted bone marrow, and even bocadillo bites. :) I also love that they brew their own craft beer and serve super delicious scratch cocktails. When I ordered the bocadillo bites it took me right back to a hot August afternoon in Barcelona, at the beach with my family playing games and munching on this tasty treat. 1. Brush cut sides of baguette with oil and season with salt and pepper. 2. 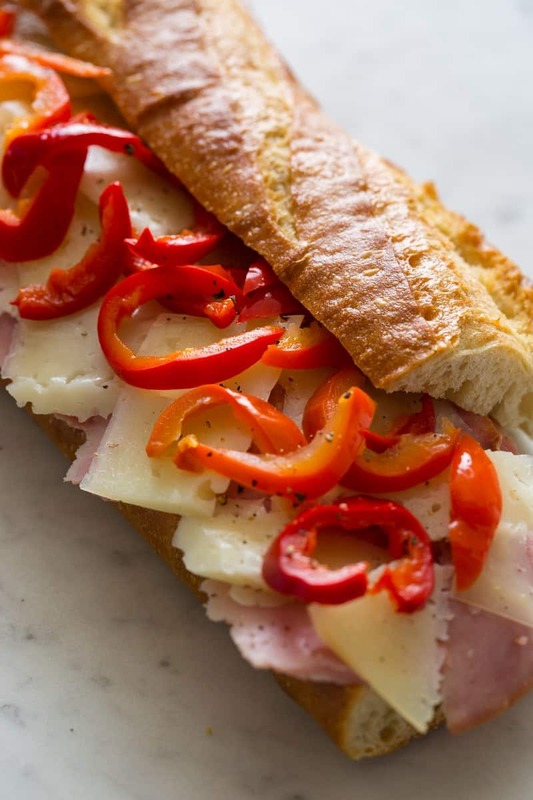 Top bottom half of baguette with ham followed by cheese and finish with the sliced pickled peppers. 3. Gently press top half of baguette over bocadillo and cut into 1 ½”-2” pieces. Serve or wrap in parchment until ready to eat. This sounds delicious! With school on the horizon I love having something different to put in the lunchbox as well. Yum. What a perfect picnic sandwich. I imagine the flavors get better and seep into the crusty baguette while sitting in the picnic basket. How wonderful! Lovelove these bocadillo sandwiches! They remind me of hot summer afternoons in Spain as well- and I go for just about anything with a roasted pepper. I have never heard of this sandwich, but it looks awesome!! 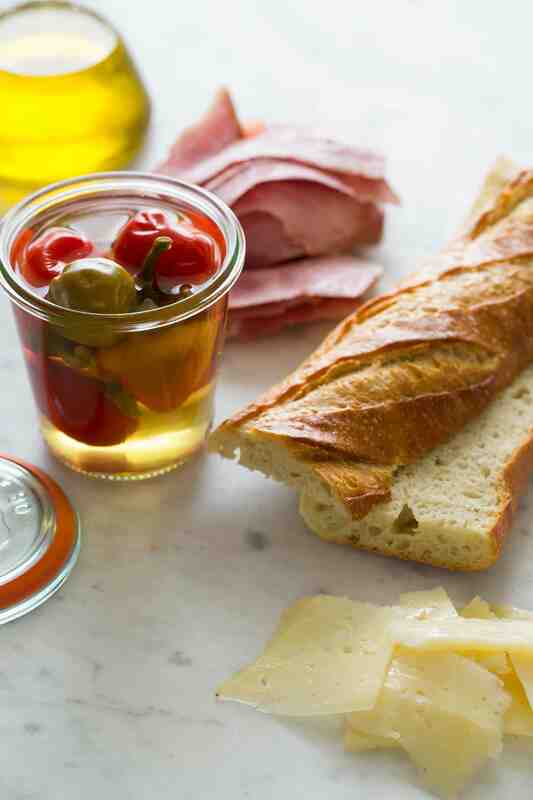 Plus, I love crusty bread and peppers! As Fred Flintstone one said LUNCHTIME! yum! This looks like a simple yet extremely flavorful sandwich! Perfect! My stomach started growling the second I looked at your pictures! The baguette looks perfect, where is it from? My love affair with manchego makes these sounds particularly fantastic! 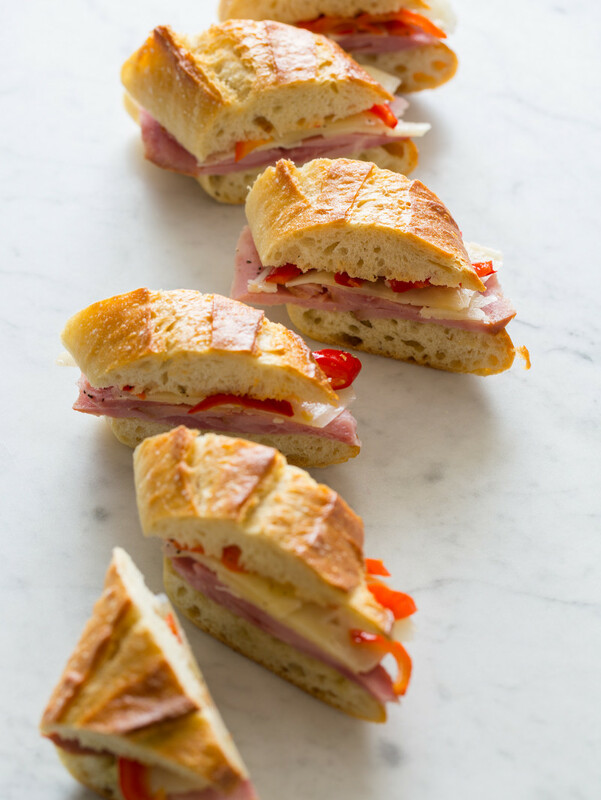 Ham, Manchego, and cherry peppers…. amazing combo. Love a simple recipe like this! The peppers you probably tasted in Spain are “pimientos del piquillo”. Congratulations for this wonderful page!! Los Bocadillos era deliciosos. Hoy, hice para mi clase para un proyecto y yo presenté la receta en frente a la clase. Disfrutan mucho. Ahora, quiero hacer para mi familia. Mi parte favorita era el pan con el aceite y las pimientas. Gracias mucho por la buena receta. Are those hot cherry peppers?